4/3/2009 — Ride agenda for today: errands. I had to do paperwork at The Creative Group and wanted to browse the MacBook Pro at Ridgedale in Minnetonka. Also insurance info to the credit union and groceries from Aldi in Minnetonka. Then an exploratory journey to Eagan ’round our new apartment to experience the hwy 77 bridge on my Vespa as a possible commuting route. I headed out to Minnetonka just after noon to fill out 2009 paperwork for doing contracting work with The Creative Group. Then swung across the bridge to the Apple Store at the Ridgedale mall. On the way to Ridgedale, I almost dumped on account of a flat rear tire. Got aired up and couldn’t detect a leak, so I continued on. Apple’s new laptop form factor is just incredible. Then it was on to the credit union and Aldi. After a quick pit stop back home to drop off bread and other sundries, it was off to Eagan. I crossed the river on hwy 77 without incident. 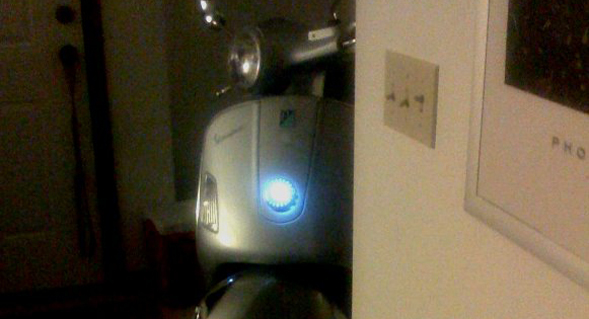 It was my first time going that fast on the Vespa and I was amazed at how much power that 200cc motor really makes. The needle was flirting with 80mph. Took the opportunity to stop in at an R/C shop a few blocks from our new apartment. Trip back was surprisingly quick, scenic, and had some fun curvy bits. Seeing all the cool new stuff in R/C flying. I haven’t really been in a hobby shop since my days as a lad. Also seeing the speedometer on the Vespa hit nearly 80 mph on flat road without really trying to. The GT is truly highway capable. I wouldn’t call it fun — riding at that speed on a scooter — but it wasn’t really scary either. When the back end dished out something awful while making a left turn through an intersection. One more dishy turn and I knew I had a low rear tire. Also one spot in the southern metro where there were two accidents within about 50 yards of each other. Sketchy set of intersections for sure. The worst though was one gritty curve that I nearly botched because I wasn’t trusting my rear tire, even though it was holding air just fine. I had to get my head back in the game, or I really was going to wreck. Side note: The photo above shows my Arc Reactor prototype. When I’m done, it’ll be a permanent installation that will actually double as a running light. Good luck with the Creative Group. I’ve had a good experience with them so far. They placed me at my last job, which really was a good fit aside from their short-sighted budget actions. My agent is a bulldog and a great inside guy for talking to the right people. The job market is really tight and unfortunately for me there’s lots of talent available that I’m having to compete with. I never used an agency for any job placement, I was just real lucky and just seemed to be in the right place at the right time for most of my career. As they say the creme always rises and I’m sure that will be your case also. Just back from AMVIV, it was fun although I wish I could do the MINI runs but my booth won’t run itself, unfortunately. Thankfully it was a prosperous event for me considering the economy.